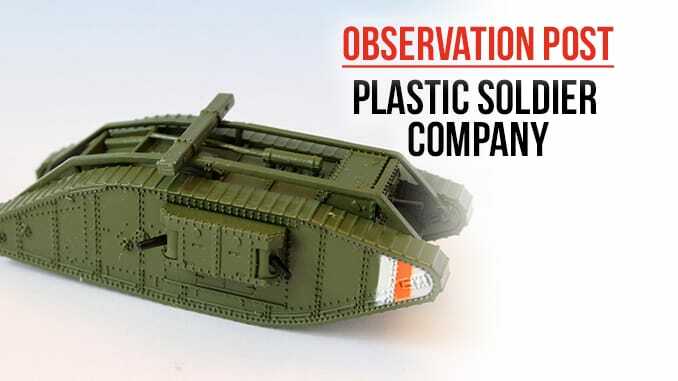 These models from PSC have been out for a while, but caught up in ‘a new project moment’, Paul Davies decided to send us this review, which we thought we would share online. I recently became interested in wargaming late WW1, Ever on the lookout for value for money in terms of cost and detail, I settled upon the Command & Colours ‘Great War’ boxed game produced by the Plastic Soldier Company which included a generous amount of infantry, and then eagerly awaited some tanks. Their first releases were a British Mk IV ‘male’ tank, and a ‘female’ version. The difference between these otherwise identical tanks was that the ‘female’ version was equipped with five .303 machine guns, whilst the ‘male’ version exchanged two machine guns for two QF 6pdr guns to enable it to better penetrate the armour of enemy tanks. Complete with unhitching beam and featuring excellent rivet detail these Mk IVs really do look good, and for assembled and ready-painted miniatures are amazing. To provide opposition for the British Mk IV tanks and enable gamers to perhaps recreate the first tank v tank combat at Villers-Bretonneux (30 March – 5 April 1918) the German A7V was released at the same time. Its another nicely detailed miniature featuring the 57mm cannon and 6 x Maxim MG08 machine guns of the original, and the model successfully conveys the lumbering bulk of Germany’s only WW1 tank. Due to the widespread scepticism of the German High Command towards tanks, only 20 A7Vs were ever built although originally 100 were planned. The Germans found themselves forced to use captured Allied tanks, known as Beutepanzerwagen, and so there is the opportunity to repaint some British Mk IVs, apply German markings and press them into service with some A7Vs, against their former owners. The fourth miniature to be released is the British Medium Mk A ‘Whippet’. Compared to the Mk IV tanks with a maximum speed of just 4mph (6km/h), the ‘Whippet’ with a top speed of 8.3mph (13.4 km/h) was indeed a veritable ‘greyhound’ or er… whippet! Again this is a realistic looking model. The four 0.303 inch Hotchkiss machine guns are particularly well reproduced, and this is probably my favourite tank in the range so far. Overall, these models all offer excellent value-for-money. They are ready assembled, nicely detailed, and painted to a basic wargames standard. As with any mass produced miniatures, they would benefit from perhaps picking out the tracks and details followed by an ink wash, and a general ‘dirtying-up’, as they are supplied very much as straight-from-factory, but they are perfectly usable as supplied and ready to do battle on the wargames table. On a cautionary note, the machine guns on the models are quite fragile, and although those on the MK IVs and A7V can be easily repaired by carefully drilling out and inserting a length of plastic rod, those of the Whippet are much more detailed and if they get broken they could be much more difficult to fabricate. I understand that future AFV releases will be supplied in a slightly ‘softer’ plastic so the machine guns will be less vulnerable. In the meantime, my solution is to give all my models a suitably sculpted terrain base. I know some wargamers are OK with that, others feel that basing spoils the look of the tank, but in my opinion it’s the best way to protect the models, and as all my figures are based, it keeps the relative height between figures and tanks looking right. So, how much are these little ‘beauties’ I hear you ask…? Currently you can buy the Great War Tank expansion set, which includes two A7Vs, two Mk IV ‘males’ and two Mk IV ‘females’ together with two German 105mm artillery pieces and crew plus tank rules, terrain tiles and 21 tank scenarios, for £39.95. But if you’re not particularly interested in the Command & Colours ‘Great War’ game and rules concept, then you can just buy single models of the British Mk IV ‘males’ and ‘females’ as well as the German A7V for £5.99 each. The Whippet is currently only available in a pack of three for £16.50. The Plastic Soldier Company’s next WW1 tank releases will be the French Schneider and St Charmond tanks, and if they are as good as these models, I’m sure that I’ll be adding them to my collection.